Google’s Keynote showcased several new gadgets, including the Chromecast dongle that enables Internet TV and the Nexus 7 tablet , which will be the first device to get Android Jelly Bean 4.3. During the demos of the latter, attendees got their first look at a few Nexus 7 games, including Gameloft’s upcoming mobile game, Asphalt 8: Airborne. 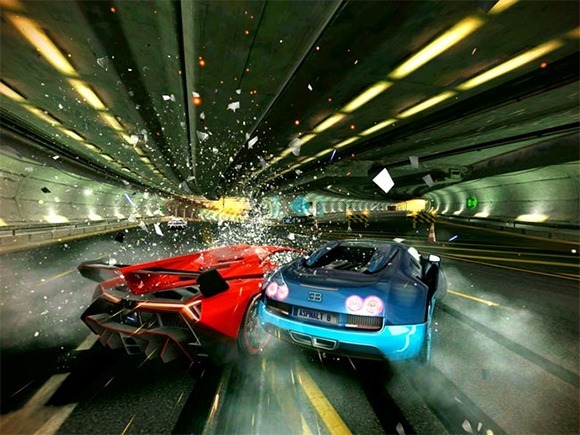 There’s a good reason Asphalt 8 was chosen to demonstrate the potential of Nexus 7 games: Gameloft worked directly with Google to optimize it for the Nexus 7. According to Gameloft, the optimizations for Google’s forthcoming tablet were “primarily adding graphic and image quality enhancements with OpenGL ES 3.0.” Additionally, Asphalt 8 will be Gameloft’s first title with Google+ and Google Play game services enabled at launch for Android. Naturally, with that sort of commitment on Gameloft’s side, Google decided to show the mobile-game publisher some love at the big coming-out party for its Nexus 7. Not surprisingly, Asphalt 8 will also include social features such as Facebook, which is frankly something we can expect from all Nexus 7 games (and Android and iOS games in general) moving forward. Gameloft operates its own established franchises such as Asphalt, Real Football, Modern Combat and Order & Chaos, and it partners with major rights holders including Marvel, Hasbro, FOX, Mattel and Ferrari. With that in mind, it’s only a matter of time before the publisher announces additional Google Nexus 7 games based on the impressive licenses with which it works (Iron Man and The Dark Knight, anyone?). We’ll bring you more information about those games as details become available, even if they don’t appear on the Nexus 7 tablet .